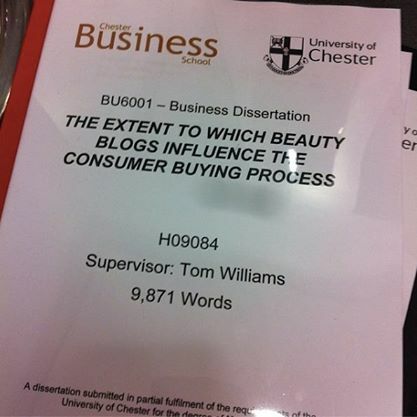 I was lucky in the fact that I was able to use beauty blogs as the main focus of my Dissertation. In order to relate it back to Marketing, I looked at their influence in relation to the Consumer Buying Process. For anyone unsure on what this is, it’s shown below. I broke down my research findings into each stage, looking at the level for influence. I used an online questionnaire, which if you have been reading my blog for a while, will have probably completed for me. I shared the questionnaire through my blog, as well as via Twitter. I ended up with around 200 respondents, which I was happy with at the time, so thanks if you were one of them! In all honesty, I’m not sure how interesting you’ll find this, but I thought with you choosing to read or write your own blogs, this may be useful to know. Personally, I love looking at the influence of social media, blogs and YouTube have on todays consumer – yes, I am a loser. My justification for carrying out this research was of course, my interest in the subject, but when carrying out research before hand, there was nothing about beauty blogs. Blogs in general had been researched, and the BBC had shown great interest in the influence of YouTubers like Zoella, but nothing about how beauty blogs specifically are influential. Each person will pass through the Consumer Buying Process differently, depending on who they are, their budget, how much time they have to make the purchase, and the type of product/service they’re looking to purchase. My argument was that although beauty products are relatively inexpensive in comparison to a new car, consumers still carry out information searches with there being a level of perceived risk with the purchase. Before starting my research I created research aims, and discussed the findings in relation to each. To identify the importance of conducting an information search when looking to purchase beauty products. The findings supported the views of many theorists, who emphasise the importance of conducting an information search before purchase. Whilst it was rated hugely important by all respondents, those aged 30-39 saw it to be most important. I used secondary research which suggested that at this age, consumers are at the peak of their financial responsibilities, and whilst they may earn more than those aged 18-20 (who viewed an information search as less important), they have less disposable income for beauty products. Although only 2.24% of respondents were male and therefore results can’t be generalised to a wider population accurately, all male respondents gave the importance of an information search the lowest score. This would suggest that when looking at beauty products for themselves (including skincare), they don’t conduct any research, and move straight to purchase. The findings also suggest that high end items, such as a £15.50 MAC lipstick have a greater element of perceived risk, and will require a more extensive information search than one from MUA which costs £1. This has been supported by a similar piece of research carried out in India. Simply, blogs were the most important source when respondents are looking to conduct an information search. This shows that not only are they used by consumers, but they are favoured over information which comes directly from the company. This supports research which has been carried out, suggesting that blogs are more credible as they are independent from corporate controlled media and therefore aren’t influenced by the company. Messages from blogs are the bloggers own thoughts and opinions and respondents can relate to them (unless their blog is full of PR samples and they’re clearly just in it for the freebies). Research suggests that consumers use different approaches when passing through this stage of the process, but as I’ve bored you enough, I won’t go into it. The findings from my piece of research suggested that evaluating alternative beauty products is important, but not viewed as important as the initial information search. 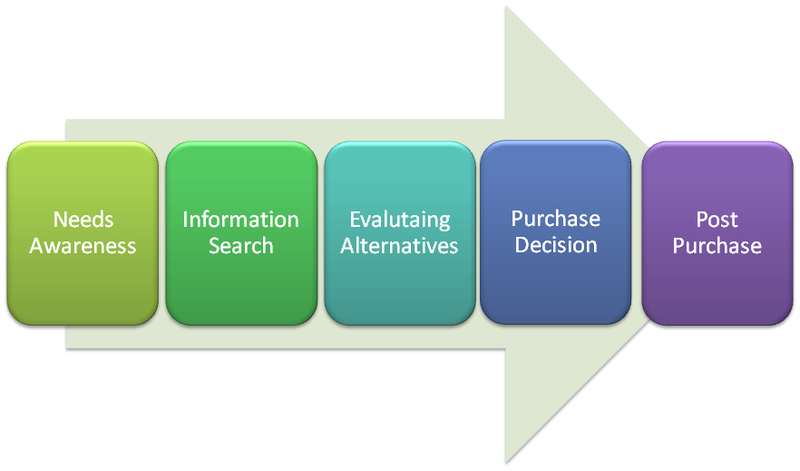 This suggests that once consumers have conducted an information search, they’ll either purchase the item or finish the process by not purchasing. Again, those respondents aged 30-39 viewed this stage more important than other respondents, suggesting that they feel more comfortable about a purchase having passed through all stages of the process, completing them thoroughly. As touched on before, respondents viewed blogs to be a more credible source as information coming directly from a company. This is due to the fact that a company NEED consumers to purchase in order to make a profit, where as bloggers simply don’t (unless part of affiliate schemes or sponsored blah blah). There has been research to suggest that bloggers can create an emotional bond with readers as they relate to the messages, which would add to their credibility. I enjoyed this question a little too much, I wanted to know what people had bought based on blog reviews and there were over 50 different products listed. The majority of the 50 products appeared more than once, with the UD Naked 3 palette being most purchased due to blogs. Other products included MAC lipsticks, Liz Earle Cleanse and Polish and a number of other products subject to ‘blogger hype.’ This shows that readers actually purchase things based on you reviews/rambles. So this turned into a ramble, didn’t it? Baring in mine my dissertation was 10,000 words I think I’ve done well to keep it to around 1,000 for this post. Basically, the conclusion I drew up was that consumers are heavily influenced by beauty blogs when passing through each stage of the consumer buying process. Of course, I only looked at around 200 respondents and this wouldn’t exactly be an accurate sample of the population, but I think it proves that we do have a little bit of influence over what people buy, and how they collect their information. The research may be biased as the sample I used do read beauty blogs anyway, if I had stood in Chester with a clipboard and stopped random people, I would have probably got a completely different result. BUT, it is still a piece of research and it valid regardless of it’s limitations. You could completely disagree with what I’ve found, and think beauty blogs are a load of crap. But I thought I’d share with everyone what I found as I find it really interesting, and although there are 1000000’s of people out there saying ‘blogs have been done, they’re all the same’, they’re influencing people, and for me, it’s pretty amazing. I’d LOVE your opinions if you actually read all of this?! Next Bloggers – Too Big for their Boots? These days I find myself pretty much incapable of buying something in a makeup store, if I don’t know how well it rates on makeupalley or if I haven’t read a review on it from someone’s blog that I trust to be unbiased. On the other hand, I have a good idea of how well some bloggers and youtubers are influenced in their reviews by the companies that sponsor them, so it also makes me vary when I see a product being pushed by some celebrity ranking blogger or youtuber. Often I won’t buy those on principle, because I despise this new way companies have of manipulating customers by using popular internet personalities that people trust to be unbiased and honest. I agree with you 100%!! I’m the exact same when it comes to sponsored posts. I’ll just disregard the review all together! I think a lot of people are naive to the fact that popular figures are paid to say they like a certain product or just to mention it. It’s scary! Yep I read it all. I’m glad you noted at the end that results would be different had you surveyed people who didn’t read blogs. I agree that those a little older than teenagers do spend longer researching their purchase compared to those younger but that is if they do that anyway. I am sure that a lot of people of whatever age do not use the interest to research beauty purchases. What degree have you been studying for? Great job and I found your post so interesting! I personally am very influenced in buying decisions based on blogs/YouTube. Thanks for sharing! I hope you got an A+ on your dissertation! Really interesting read I know I’m definitely influenced by reading beauty blogs! Great post! Your dissertation sounds so interesting. Amazing that you got to do it on beauty blogs when you’re doing one yourself 🙂 I’m doing a PhD in fashion at the moment and I teach lectures on marketing- including blogging- so found it fascinating. I think it would be really interesting to do a comparison study of the people in the street like you said, to see how different it would be! As a reader and writer of a blog I know what you mean by blogger hype! Gone are the days when I would just pick something up on a whim – even now when I’m pondering popping a little something in my basket I’m jumping on a wi-fi hot spot and googling for reviews before I’ve even left the aisle! And I know 9 times out of 10 I skip past the Amazon or Beauty Alley reviews and go straight to something with a .blogspot url! When I see the same products coming up on my favourite blogs I notice them more in shops, I find myself reaching for things I’ve seen reviewed and talked about, it’s almost a subconscious act now! I agree, they’re so influential! Even my friends go searching thru my blog or ask me to link them to any posts Ive written about a certain product or subject. nice to read.thanks for sharing this.I would explore your site. Thanks so much for this post, Bethany! I was actually researching stats for beauty blogs, which is what drew me to your site (you’re right, there isn’t much out there for beauty blogs specifically). As someone who reads tons of beauty blogs, I absolutely agree that I use them to help with product recommendations…and fall right into the age range you identify as information seekers. I was looking for data as I’m developing an app for people like me (and you, and probably many of your readers!) to be able to save all the beauty content you find interesting (such as articles, videos, images, and products) in one place…and provide the ability to add personal notes and organize them into collections so you can find and remember them. Appreciate the info, and just followed you on Bloglovin!